Meet W&L’s Oldest Ceramic In the first installment of our new series, Ron Fuchs tells the story behind a 4,000-year-old jar in Watson Pavilion. Welcome to “From the Collections,” a brand new series in The Columns that will highlight the many fascinating objects in University Collections of Art and History. Through the ages, Washington and Lee University has been a trusted steward of art and history; today, it is home to thousands of important works and historic objects that are housed under the umbrellas of The Reeves Collection, Lee Chapel and Museum, and the Art Collection. Some of these items are on display for the campus community and visitors to see, while others are currently housed in storage. In addition, the university frequently acquires new objects for the collections. In monthly installments written by UCAH staff, “From the Collections” will tell the stories of some of these items, from the oldest objects in the collections to the most exciting new acquisitions. Stay tuned for another new series, “Out of the Vault,” that will focus on the Special Collections Department of Leyburn Library and will debut within the next few weeks. This jar, made in China more than 4,000 years ago, is the oldest ceramic in W&L’s collection. This large jar, which is on display just inside the front door of the Watson Pavilion, is the oldest ceramic in the Reeves Collection, and is one of the oldest human-made objects at Washington and Lee University. It was made in northwestern China more than 4,000 years ago by people of the Majiayao Culture. These people did not have potter’s wheels (which were developed in southern China about 3000 BCE), so this piece was made by stacking long coils of clay one on top of another, and then joining them together with a paddle to make a smooth, thin-walled vessel. The jar was probably made to store food for the afterlife, and would have been buried with its owner. 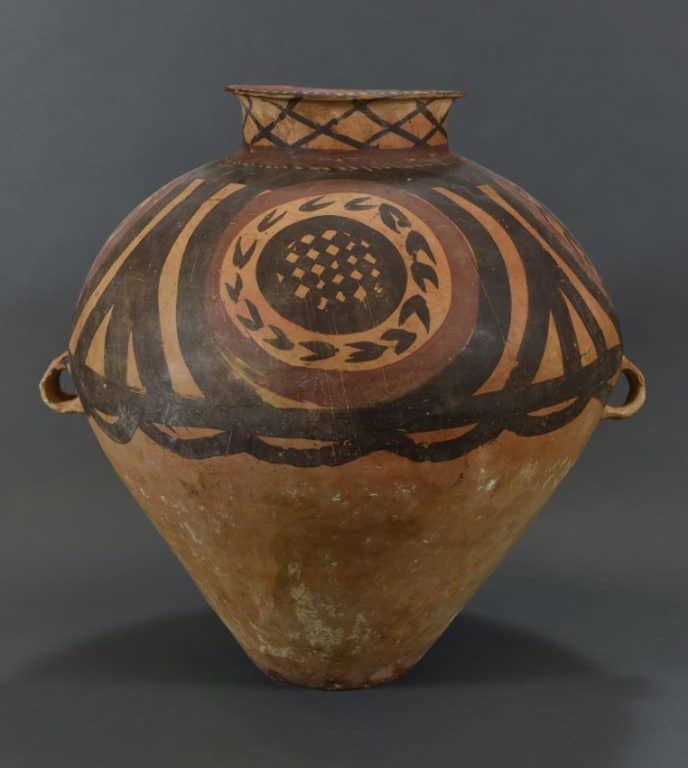 Since the people who made this jar left behind no written record, we have no real idea about whether the jar’s decoration had religious or cultural significance, or if it was done to satisfy what seems to be an innate human desire for decoration and pattern. Some scholars have seen in its swirling lines evidence of an interest in brushwork that would later manifest itself in calligraphy, one of China’s highest art forms. The jar was bought by a group of donors to honor Elizabeth Watson, who gave the funds that built the Watson Pavilion. However, the acquisition of jars like this is not without controversy; they are found below ground, usually in graves. Disturbed during construction or outright looted, they are robbed of their context and often smuggled out of China. When the Reeves bought this jar in the 1990s, museums were not aware of — or were not concerned about — such issues. Today we are, and we would not acquire something without a known provenance (museum-speak for an object’s place of discovery and history). Ancient jars like these are also players in the contemporary art world. The Chinese artist Ai Weiwei has painted similar jars with the Coca-Cola logo and dipped others in brightly colored paint to symbolize the destruction of traditional Chinese culture by government oppression and globalization.